► Blindingly fast. But talented, too? We have now driven the Lamborghini Urus in the UK, as well as on its international launch and as a prototype. The more CAR magazine staff who take the wheel of this shock-and-awe SUV, the more we get to understand it. For it is not natural to take the keys of a Lambo and perch so high; to see the silhouette of an SUV when you mention a car named after a bull; and to hear the whoosh of a turbo when you stand on the throttle in a product hailing from Sant'Agata. We had another go in the new Urus SUV at the 2018 Goodwood Festival of Speed - and a few runs up and down the Duke of Richmond's hillclimb revealed a little more of the car's character. It's certainly one of the most surprising SUVs to roar off the line, smashing a square hole in the air as it thunders past 62mph in just 3.6 seconds, every single one of the 627lb ft being transferred to the tarmac. If the duke's driveway was a bit longer and a bit less flinty, we have every reason to believe it'll hit its claimed 189mph top speed, too. Granted, a Goodwood run is only a fleeting new experience in the Lamborghini 4x4. But this was our first go in a right-hand drive, UK-spec Urus and - rest assured - we'll be getting a full drive in Britain shortly. Stay tuned for a more extensive UK Lambo Urus review in due course. While the new Lamborghini Urus 'Super SUV' isn't the Italian company's first attempt at going off-road (who can forget the brawny LM002 of the 1980s? ), it is the first of a new generation of seriously high-end SUVs that hopes to capitalise on the world's obsession with high driving positions and the associated social status. Hot on the heels of the Urus will be alternatives from Rolls-Royce, Aston Martin and Ferrari, so Lamborghini needs to make its mark before the waters become too crowded. To get up to speed (quite literally), the Urus employs some choice hardware from the wider Volkswagen Group, including its twin-turbocharged V8 and 48-volt anti-roll system. But, Lamborghini argues, it has all been brought together in a uniquely Lamborghini fashion, wrapped in an aluminium shell that leaves the smartphone wielding onlooker in no doubt as to who makes it. That's backed up by a breadth of capability usually the preserve of the Range Rover brand. Indeed, and the company's stylists cite the aforementioned LM002 as a source of inspiration, though the Urus pays as much homage to the current generation of Lamborghini sports cars as it does the square-jawed late-eighties icon. It's all sharp edges and jaunty angles, self-conscious wheelarches and lots of vents and grilles. Whisper it, but is it a tad overdesigned? The windows and lights looks a little small from some angles and it needs the optional 23-inch alloy wheels to pull it all off. Still, the rest of the world gapes as it goes by, just as they do at any other contemporary Lamborghini, so job done some would say. It may be too outré for some, but the pointing and gesticulating we experienced driving it in the UK suggests it'll certainly turn heads. The interior will probably gather more universal praise, as it's beautifully put together and plenty spacious, too. Buyers choose a four- or five-seat layout and there's even a massive boot behind. But it's the centre console and the dashboard that'll hold your attention. Sure, the double-touchscreen set-up is used in the Audi A8 and others, but all the graphics are unique to the Urus and it's neatly integrated. Your attention is drawn away from all that to the massive 'Tamburo' driving settings selector, allowing access to as many as six pre-programmed modes and the individual 'EGO' option. However, we found the gear selector pointlessly complicated. Instead of a conventional gearlever, there's an over-stylised choice of buttons and rockets to pick the right ratio. Looks fussy, is complex, doesn't really work in our view. Does the Urus drive like a Lamborghini? 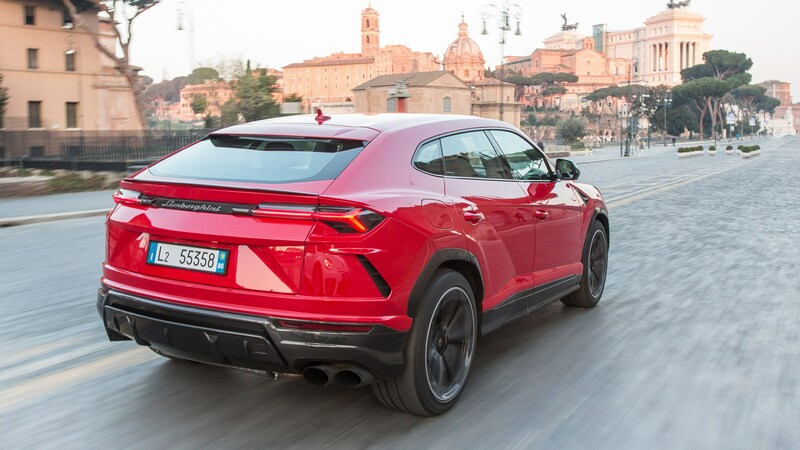 The Urus certainly ticks the box marked 'bleedin' fast' thanks to the familiar twin-turbo V8 under the bonnet – Lamborghini's first use of turbos, incidentally. Despite weighing a smidgen under 2200kg it can do 0-62mph in 3.6 seconds and it tops out at 190mph. Sure, that V8 isn't quite as sonorous as the company's V10 and V12 engines (and it can be quietened right down in lesser driving modes), but it's happy to shout when you give it its head. We have driven the Lambo SUV abroad and in the UK now and can confirm that it'll squash you relentlessly into your seat backs off the line: acceleration is brutal, turbo-fast and seemingly never-ending. 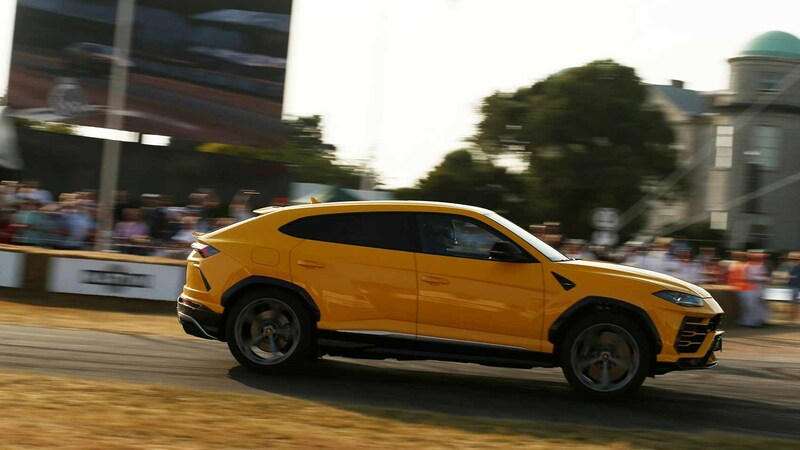 Thankfully the huge brakes do a good job of wiping off all that speed, too; on one run up the Goodwood Festival of Speed hillclimb, we had to make an emergency stop -and the Urus decelerates calmly, confidently and with huge reserves of power. As ever, the driving modes play a large part in the Urus's character, moving it from acceptably comfortable cruiser at one end (no doubt it would ride better on the smallest wheels, 21-inch rims) to rabid track tool at the other. And, thanks to massive carbon brakes, a Torsen centre diff with rear bias, torque vectoring at the back, four-wheel steering and active anti-roll, the Urus is eerily fast on a race circuit. There's not much communication through the chunky flat-bottomed steering wheel and there's still some body roll, but it's more fun to drive quickly than you'd expect. It's right up there with the best sporting SUVs in terms of poise and agility. What's more, if you've ticked the Off-Road Package option, ground clearance is further increased in two specific off-road modes and the Urus doesn't feel out of its depth when the terrain gets tricky. This is the first Lamborghini in a long time you won't need a nose-lift upgrade for. 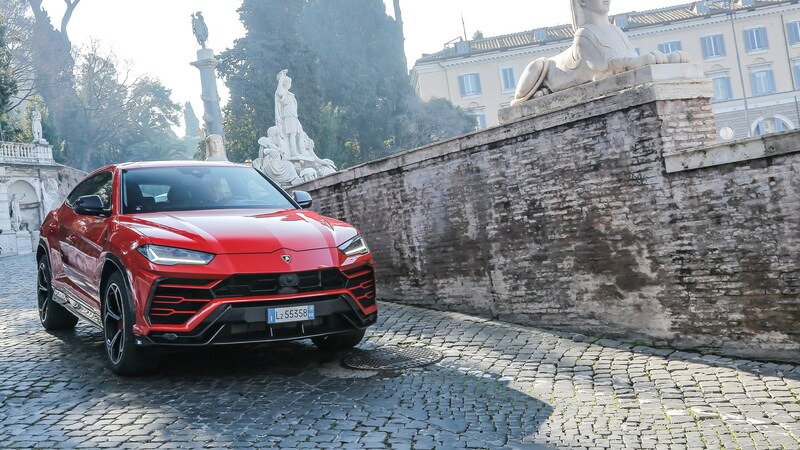 Until Ferrari and Aston launch their SUVs, there really isn't anything quite like the Lamborghini Urus on the market. It's indecently fast, whether the road is straight, curvy, bumpy or not a road, it looks unique and it can carry all the family or friends when needs be. The only question remains for those with the cash: be an early adopter or wait it out for the even faster SV version?